S A T U R N is the sixth planet to orbit the Sun, being the outermost planet that is still conspicuous to the naked-eye in the night time sky. 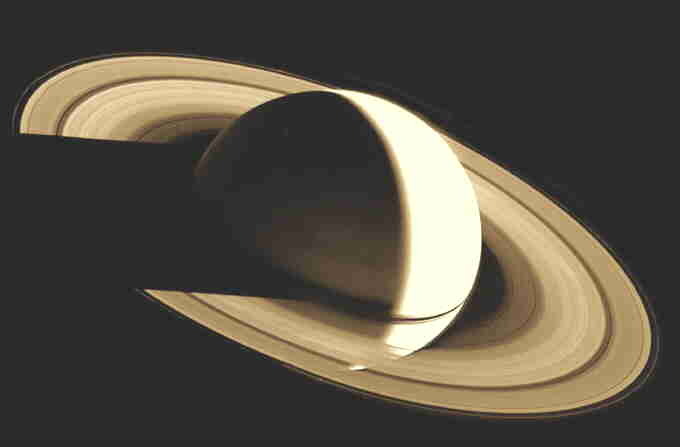 Saturn is very much like its larger cousin, Jupiter, and is the second largest planet in our Solar System. Its equatorial girth is 120,000 kilometres across — easily dwarfing Earth. It is placed as one among the four outer gas giants, that includes planets Jupiter, Uranus and Neptune. Yet the basis of the true glory of Saturn, and no doubt the fundamental reason for its great popularity among children and the general public, resides centrally in the magnificent rings that are clearly visible even in the smallest of telescopes. In distance from the Sun, the orbit averages around 9.5 A.U. or 1.4 billion kilometres — some 60% further away than Jupiter. Accordingly, Saturn receives only 1% of the sunlight we receive here on Earth. Equatorial : 120 536 km. Polar : 108 728 km. Compared to all the planets, Saturn is also known to contain the highest percentage of the most common element in the Universe, Hydrogen. This makes Saturn one of the least dense of all the family of planets orbiting our Sun. 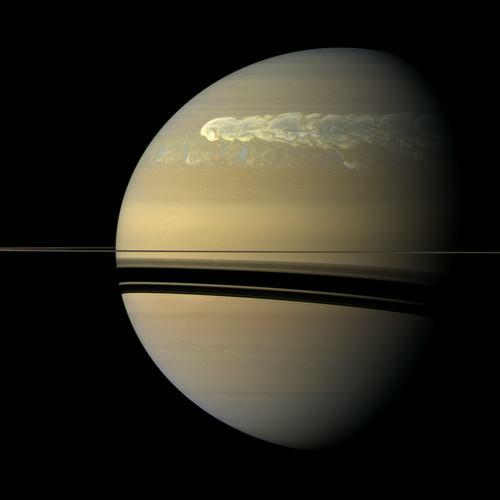 Calculating the mean density finds is very much less than Earth, meaning if you could place Saturn in a very large bowl of water it would be buoyant and float! Within the huge bulk of Saturn, like Jupiter, we think the planet may have a small rocky core perhaps about four or five times the diameter of Earth. Telescopically, the planet is somewhat flatter than Jupiter, appearing as an oval ratioed at 13:14. This oblateness, at times, may not be so obvious, mostly due to the rings causing optical illusions with our eyes. Furthermore, unlike Jupiter, whose tilt is 3°, Saturn disk can be tilted by up to 28½°, and this causes samall difference the curvature on the top and bottom parts of the boundary. We may often think Saturn to be the plainer, calmer and cooler version of Jupiter. Its clouds do appear less vivid and more yellowish, and this is likely because the upper atmosphere of the visible cloud layer seems both less turbulent and has the faster streamline flow. This has formed by the rapid axial rotation of the planet whose duration is about 10 hours 14 minutes. This moves continually eastward, averaging about 160 m.s-1 (metres per second) or 580 kilometres per hour, peaking across the equatorial regions at about 500 m.s-1 per second or 1,800 kph. — some ten times more rapid than Jupiter. Spectroscopic observations of the upper atmosphere has been found to be composed of 96.3% Hydrogen and 3.3% Helium, as discovered by Harold Jeffreys in 1923 & 1924. (Abundances were later found in the 1960s.) In much smaller proportions finds the atmosphere composition intermixed with water, and some simple organic compounds like methane and ammonia, plus traces of acetylene, ethane, propane. There are also various sulphur-like compounds in the lower cloud base that exist mostly as ices, including ammonium hydrosulfide (HN4).SH, which contributes to the distinct fawn or yellowish colours we visually observe in telescopes. At one atmospheric pressure, around 52 km. below the cloud tops, the average temperature is 134K or −139°C, and this is some 21° cooler than Jupiter or 60° warmer than Uranus and Neptune. Frequently, many streaks and faint bands appear to cross Saturnian disk. I.e. The Wide Field Planetary Camera 2 (WFPC2) image from the Hubble Space Telescope (HST) taken in 7th March 2003. Often we can sometimes even see small white spots and storms, whose appearance maybe related to solar activity. 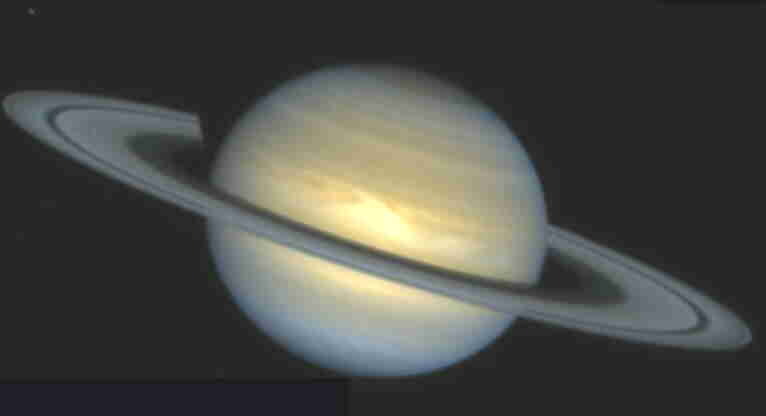 (See the 1994 HST image of Saturn, above.) These have been recorded at regular intervals over the years. Both the Voyager spacecrafts showed during the early 1980s detailed close-up images of the many tiny swirls and streaks, but little else. With the new Cassini spacecraft to arrive at Saturn at the beginning of 2004 will hopefully shows little more detail with the higher resolution cameras. There also seem to be a thin haze, similar to photochemical smog, that lies just above the Saturnian atmosphere — that may also account for its apparent bland appearance. Appearances of white spots are very interesting because they show regular periodicity and are perhaps more prevalent when Saturn is in the same place in its orbit. Amateur astronomers discovered and observed these outbursts of these spots in 1878, 1903, August 1933 and 1960. This was again occurring in October 1990 and December 1994 seen from both ground based and Hubble telescope images of Saturn. (See Below.) Another event, now known as the Great White Spot, was observed in December 2010 Most of these events are quite short-lived, often only persisting for one or two months.